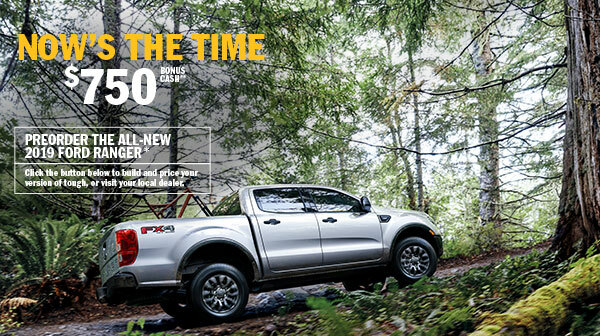 Discussion in '2019 Ford Ranger' started by Rick, January 15, 2018. No diesel Ranger = wtf? Even the Colorado has a duramax and the nissan a cummins jeep wrangler is also getting a diesel so I hear? Come on ford do it!! They are now offering a $750 Bonus Cash offer for pre orders. Details: *Preorder by 1/2/19 and then take new retail delivery from an authorized Ford Dealer's stock by 7/2/19. See dealer for details. **$750 on the all-new 2019 Ford Ranger XLT or LARIAT only. May not combine with other private, conquest or commercial offers. A/Z/D Plan ineligible. Nontransferable out of household. Limit one per household. U.S. residents. Must redeem using original offer; no duplicates accepted. Prior purchases not eligible. Preproduction model shown. Available early 2019. **$750 on the all-new 2019 Ford Ranger XLT or LARIAT only. A/Z/D Plan ineligible. I removed "any" from my statement. However I would think most orders are going to fall outside of those ineligibilities. More specs came out over the last two days. Hmm. That HP number is a little less than I expected. Agreed, but with so much after market support, it's nothing a programer can't fix. Also think they are under rating it on purpose. But don't forget you still have a 10 speed. It’s the same engine in the explorer that puts out 280. 310 in the mustang. But 270 is plenty and should be more reliable. My last explorer had 240 and my FJ was 260 and both had power to spare. And they are both much heavier. 48 to 1 crawl ratio. So what does everyone think about towing an 18 foot camping trailer with this? Probably about 5000lbs fully loaded. I know the specs say ok. But what about real life? Actually my plan is to tow the Navajo on a flat bed when it's done to the trails. That will probably be close to maxing it out, but we'll see. Time will tell. I know it will probably need some mods for more power, and as long as it's not all the time it should be ok, as the trans should be fine as it's the same as a F150 trans. Not sure on the rear axle. Now that said....this is what could have killed my trans and rear end in my '05 f -150 I had. I towed at max with a programer. I can't confirm that however, because they went out a month after I sold it. Who knows what the guy after me did with it. You may want to keep a zoomed eye on the lot come January.. you just may see it! They only update those images to the public every year or two. If you look at the images, you can still see Focus...es? Foci? What ever plural is. Yet they stopped production of the focus in that plant in May of this year. So today I had the opportunity to drive the new 2019 Ranger. Ford offered a drive event where originally they were spose to let you drive up and over a bridge thing, but they changed it and decided to let us take it for a spin on public streets. They also had one to sit in and take a look around. This is my first impressions. I will have another opportunity in a few weeks at the LA auto show. Interior: very comfortable, good seating position, and room. Everything is right where you need it, I didn't need to go hunting for any controls. The rear seats are decent. I'm 6'1” and I can fit behind myself, but I wouldn't want to take a long trip. The bottom seat is 1 piece, not a 60/40 which is kinda dumb. That means everyone has to move if you need to get something. There is some storage under there but not much. The rear window is really small. It only maybe 10” tall or so. The slider is really kinda worthless. Desperately needs a powered option. Exterior: This has a nice look to it. Easy close tailgate. Nice ride height. Plenty of room for bigger tires. Feels simple, but in a good way. Drive: Power was ok, but I think I'm use to 4, 5 and 6 speed transmissions. Your always pretty low in the RPM's because of so many gears. You don't even notice the trans shifting. These have start/stop technology, and again I didn't even notice it. You do feel the Torque though. I question towing a bit, but I really needed more seat time. It drives super smooth. But stiffer the my ’16 Explorer. Mileage: Talking we with the Ford guy on the test drive, he said they drove it out here from Michigan. They stopped in Arizona to pick up a trailer. The test drive truck showed average MPG of 21.5 and that's with everyone flooring it, and driving no more then 40mph on the street. He said they got 25 coming out here, but they were pushing it pretty hard and fast driving out here. They were flying through Texas. He said he well excepted it to get 30mpg on the highway.